Each of these interior design blog posts and photo galleries deals with the use of color in home decorating. So guess what today’s blog topic is? I don’t know anyone who hasn’t struggled at one time or another with paint colors. Using paint chips is great, but it’s often hard to tell what that gorgeous tangerine on the card will look like covering a 10×14-foot wall! Of course, wall paint represents just one way to incorporate color into your interior design. And sometimes going with neutrals is not only the easiest choice but the one that enables you to showcase your collections (such as blue Delft ware), accessories (such as a vintage Capodimonte chandelier), or fine furniture (such as an antique Rococo dining table with ornate carvings). This cozy fireplace sitting area features a blue and white design, with a celadon-colored door for interest. Colorful cushions on the chairs add movement to the space. I love the little pair of sconces that flank a pair of stacked prints above the mantel. This symmetrical design gives the space a formal feel, while the cushions keep things a bit contemporary. And I love the round table! A designer once said “every room should have at least one round table,” and I couldn’t agree more. This dining room combines reds and blues for a French Country style interior design. I love how the decorator carried the blue toile used in the valances to the interior of the open china cabinet in the corner. Brilliant! The sheer curtains create a romantic ambiance, and the rust red color in the tablecloth gives the space warmth. Ditto for the warm wood floors you can see peeking out at the corner of the rug. As a final touch, the decorator added colorful fresh-cut flowers for a pop of yellow and purple. All in all, this room represents a great use of color in interior design! Here’s a great example of how a neutral color palette can serve your interior design. The walls, drapes, dining chairs, and area rug all are done in shades of beige. This draws the eye first to the rich, brown dining table. Next, you notice the pretty purple irises in clear vases on the table. Finally, your eye wanders to the gorgeous blue china cabinet. The simple wire-frame chandelier seems to float in the space; an ornate, crystal chandelier here might overwhelm the design. As you can see, you don’t need to fear color in your interior design. If you don’t feel bold, go neutral and accent with colors you love. If you’re fearless, crank up the paint sprayer and refresh your walls with something vibrant! Are you fearless when it comes to color in your decor? Give us your thoughts in the comments! This entry was posted in Home Design Ideas and tagged accessories, blue, color, color palette, cottage, Delft, home decor, interior decor, interior design, neutral, paint color, photo galleries on February 28, 2013 by admin. The bone-chilling cold of winter currently grips much of the country, and it’s the second such blizzard in less than a month! If you need something to warm you up physically and mentally, why not hold a tea party? Many of our clients own Victorian homes that they’ve either fully restored or are in the process of restoring. But no matter where you live, a proper English style tea will warm your tummy and your heart! 1. Choose a good, black tea such as English Breakfast tea. Loose tea will give you a great result. Place the tea in a tea ball or knot it in a piece of cheesecloth and drop it into scalding (not boiling) water. Let it steep to your desired color, usually 5-10 minutes. 2. Start with a great savory. To quell the appetite, begin your tea service with a hot, bite-size morsel. You can go fancy, with something like Mini Mushroom-Beef Wellington, or choose something a little easier, like these miniature quiches with bacon and chives. 3. Add a classic cucumber sandwich. Usually served as part of the savories, the cucumber sandwich is a staple of English teas. This recipe for Buckingham Palace Garden Party Cucumber Sandwiches may not be the queen’s own, but your guests will find them tasty! 4. Add scones with clotted cream and fruit curd. What we would call a “biscuit,” the English call a scone. And you simply can’t serve an authentic “cream tea” without clotted cream and curd to top the biscuit. You can use any flavor of fruit curd, though lemon curd is always popular and can be purchased at most grocery stories. You also can use regular jam. And you can make your own clotted cream. Here’s one great clotted cream recipe. And here’s another recipe for mock clotted cream. 5. Finish with something sweet. Indulge your palate with an authentic French macaron that’s as tasty as it is pretty. They look fancy, but they’re not really that hard to make. Check out this recipe for Macarons Aux Amandes. Of course, you’ll want to set a pretty table, with lace doilies, linen napkins, and your best tea service. Take your tea by the fireside and ride out the cold winter storm in warmth and style! This entry was posted in Entertaining and tagged clotted cream, cucumber sandwich, English breakfast tea, English tea, lemon curd, macarons, macaroons, recipe, recipes, scones, tea party, tea service on February 26, 2013 by admin. In this third episode in our series about the best way to clean and wax antique furniture, Greg at EuroLux Antiques shows you how to buff off the applied wax using a brush attachment on a drill. In case you missed the first two episodes, Part One describes how to best clean antique furniture, while Part Two shows how to apply a thin layer of wax to your antiques.We’ve tried a great number of paste wax products, but we prefer TLC wax because it is easier to buff and gives a nice, warm glow to antique furniture. Apply a thin layer of wax to your piece of antique furniture with a soft-bristle brush and then let it set for at least a half an hour – the longer, the better. Even overnight would be fine. Just make sure to use paste wax that has beeswax in it. We clean and wax a great amount of antique furniture, so we’ve learned how to do it quickly and with the least amount of effort. We highly recommend using a corded drill with a soft, natural fiber brush attachment. You can also get a paint brush from a hardware store with a narrow handle and cut it down to fit in your drill. Now use very light pressure and move the brush attachment in a circular motion back and forth across the piece of antique furniture, doing small sections at a time. The wax will begin to heat up and then will begin to shine. We recommend using a micro-fiber towel to give a final polish to your piece of antique furniture. You can find big packs of micro-fiber towels at warehouse stores or hardware stores. Greg like to ball up a micro-fiber towel in his hand and then very lightly rub it quickly back and forth across the area where he has buffed with the drill attachment. When it feels smooth like glass under your towel, you’ll know that you are done. Stay tuned for the next blog post for more tips on how to best clean and wax your antique furniture. Let us know if you have any questions! This entry was posted in Antique Furniture, Restoration Tips & Tricks and tagged Antique Furniture, antique furniture care, how to clean antique furniture, how to wax antique furniture on February 25, 2013 by admin. Just because you’ve chosen to decorate your home with antiques doesn’t mean your pet’s life has to go to the dogs. While our fine French antiques are only for human consumption (well, mostly), your furry family members can enjoy equally opulent furnishings to suit their tastes. I set out to discover what type of luxury pet furniture was available today and learned your dog or cat can live very comfortably, indeed! As you know if you’ve read this antiques blog much, Greg and I are the proud parents of eight (!) furbabies. Some of them live at the gallery, and some of them stay at home. While our cats and dogs seem content with run-of-the-mill beds and cushions (and chairs), they’d probably love to be pampered with some of the upscale pet furniture I found. 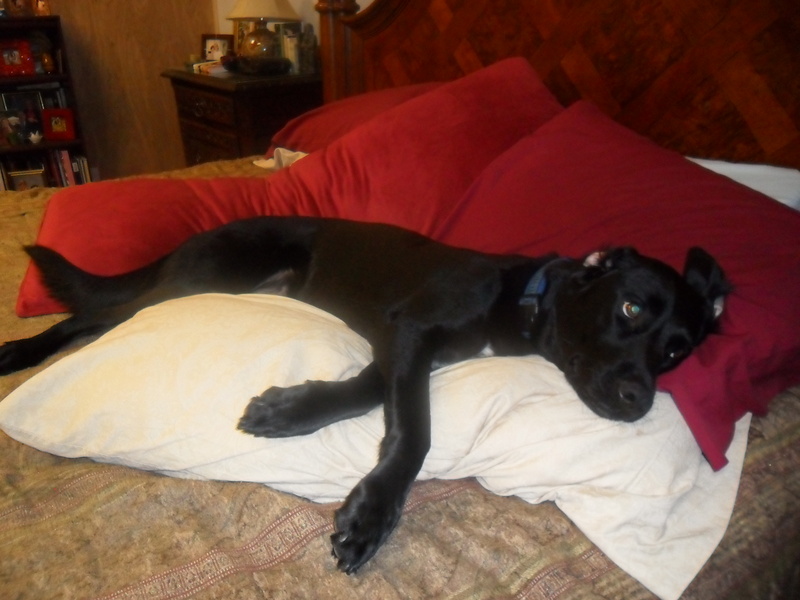 On a typical day, our dogs and cats (that’s Jake above) lounge on our decidedly common mattress. Imagine how much happier they’d be on a Louis XVI sofa like the ones carried by Une Vie de Château. Choose from a style like the one shown in the logo here, or pick something more exotic, like their “Marie Antoinette” bed a la polonaise with a pink canopy, gilt frame, and real ostrich feathers. If Asian design is more your style (and, remember, we carry Chinese antiques, too! ), check out the fabulous Pagoda bed from Precious Palaces Handcrafted Interior Pet Houses. Your cats or small dogs will feel like a pasha while snoozing on this lovely bed, which you can see in this House Beautiful slide show of luxury pet furniture. Your cat(s) should not be neglected, either. Ditch your cheap carpet-covered scratching post for something that blends in better with your fine furnishings. This high-quality walnut scratching post from Five Pet Place features a black quartz inset and crown molding design. Keep claws away from fine antiques without sacrificing style. Five Pet Place features other luxury cat furniture, including a gorgeous litter box that looks like an end table. For those who truly treat their pets like family, custom built playhouses are available from La Petite Maison. Custom built on-site, these are no ordinary “doghouses.” These tiny houses can be built to match your home design or style, from Victorian to cottage and beyond! If you’re not too into upscale pet furniture but would enjoy a fun way to add your pets into your furnishings, check out these custom made silkscreen pet pillows! You send in a photo of your pet, and Etsy vendor Shannon Broder turns it into a figural pillow of your favorite pooch. Or cat. Or bird. These pillows would make a wonderful memorial for our furry friends who wait for us on the Rainbow Bridge. Keep them in your hearts (and on your sofa!) forever. What do you think about upscale or luxury pet furnishings? How far do you go in pampering your pets? This entry was posted in Home Design Ideas and tagged cat furniture, dog beds, luxury pet furniture, pet furniture, pet pillows, upscale pet furniture on February 21, 2013 by admin. With the Academy Awards show right around the corner on February 24, I thought you might enjoy a glimpse into the home of our client Gil, who has won five Emmy Awards in his career. Gil lives in a beautiful, southwest style home in Pueblo, Colorado. He displays his Emmy Awards on a kiva style fireplace. As you can see, Gil is an expert at mixing and matching styles. Looking carefully, you’ll see how he combines Asian accessories with fine French antiques, like the chairs we sold him for his dining set. Gil had married a pair of antique dining chairs to his rather petite table, but seating for two does not a dinner party make. On the hunt for chairs to match his existing ones, he came across a set of chairs in our eBay store. The problem was Gil didn’t need a whole set of chairs. He just needed a pair. What Gil didn’t know was his problem was ‘no problem’ to us! We didn’t mind breaking up the chair set. Customer service is always our goal. Just for the record, to us no one is a “nobody”! We like to make friends with all of our clients, and we’re thrilled Gil now counts us among his friends. Partially retired from his Hollywood career, Gil enjoys making art pottery these days, such as this lovely birdbath, which you can view at his Fotki gallery. Given the view from Gil’s home, Colorado prairie stretching to distant mountains (see below), I can well imagine where he gets his inspiration for creating such magnificent ceramics! This entry was posted in Antique Furniture, Client Spotlight and tagged academy awards, Asian accessories, emmy awards, French antique dining chairs, French antique side chairs, Hollywood, John Travolta, John Woo, kiva fireplace, Nicolas Cage, southwest style on February 19, 2013 by admin. In this episode, Greg at EuroLuxAntiques continues to teach you the best way to clean and wax a piece of antique furniture. Just to bring you up to date, in the first video of this series, Greg showed you how to use Howard Restor-A-Finish to remove the built-up layers of old wax, dirt, and grime on the surface of the piece. It is best to use a natural fiber brush attachment with a drill, but you can also use fine grade (0000 4x) steel wool. Once you have cleaned your antique furniture, you should use a good quality paste wax in order to protect and enhance your antique furniture. A nice layer of wax protects the original finish against dust and sunlight, and helps to keep the moisture content of the wood stable. You only need to wax your antique furniture once per year, and otherwise just use a clean, barely damp cloth or a duster to remove the dust on a regular basis. We’ve tried just about every paste wax out on the market, but we prefer TLC furniture wax for antique furniture. It comes in a variety of stains, but we prefer to use the neutral variety for light-colored wood and the mahogany color for all dark-colored pieces of antique furniture. While they do make brown and dark brown, we find that the mahogany gives a nice glow to the darker pieces. We use a soft bristle brush to apply a thin layer of paste wax, but you can also put it on with fine grade (0000 4x) steel wool. Apply the wax in a light, circular motion, trying to go with the grain, so that you work the wax down into the grain of the wood on your antique furniture. Be careful to not to put too much on as it will make it much harder to buff off later. You should begin to see a haze over your antique furniture where you have applied the paste wax. Now it is best to let the wax dry for a minimum of 30 minutes, but better is several hours, or even overnight. Stay tuned for the next episode, as Greg will show you the best way to buff off the paste wax that you have applied to your antique furniture. Aimee owns EuroLuxAntiques.com with her husband and best friend, Greg. Aimee sources amazing antique furniture, vintage lighting & high-quality reproduction furniture to help her customers decorate their homes in a unique way. She loves her 8 (you read that right) fuzzy children and is renovating a 1920s bungalow in South Carolina. Connect with Aimee on Google+ or subscribe to this blog! This entry was posted in Restoration Tips & Tricks and tagged Antique Furniture, antique furniture care, cleaning antiques, how to clean antique furniture, how to wax antique furniture, TLC Paste Wax, waxing antiques on February 18, 2013 by admin. Here at EuroLux Antiques, we clean and wax a great deal of antique furniture. While we only buy pieces that have been well-loved through time and are in good condition, most of the time they still need to be cleaned in order to look great. This blog is the first in a series of 5 about how to take care of your antique furniture. Often folks tell us that they believe they need to strip and refinish a piece of antique furniture that they have at home. We always emphasize that is the last thing you want to do, as stripping and refinishing antique furniture will decrease the value of the piece. Instead, we recommend that you should first try cleaning the piece. Sometimes a piece of antique furniture that looks dirty, dry, and faded just needs a little TLC to make it look great again. You can use Murphy’s oil soap and water, but be sure to thoroughly dry the piece afterwards. We have found great results using the restorative product, Howard Restor-A-Finish, and we highly recommend it. It comes in a variety of colors, but we use either neutral for light-colored wood or dark oak for dark-wood pieces. You can apply Howard Restor-A-Finish with fine grade steel wool (0000 4x), but we prefer to use a natural fiber brush attachment for a drill. We use soft t-shirt fabric to apply the liquid and then use the brush attachment to clean the piece, always trying to go with the grain of the wood. Then wipe off the excess and let dry. The piece of antique furniture should now feel much smoother to the touch, as you will have removed the surface layer of old wax, dust, and grime. Greg will show you how to wax a piece of antique furniture in our next blog, so stay tuned for Part 2! This entry was posted in Restoration Tips & Tricks and tagged how to clean antique furniture on February 16, 2013 by admin. Nothing’s more fun than hunting for antiques, but reading about them comes in a close second. These recently released or forthcoming books will entertain, inform, and inspire you in your antique hunting adventures. This title by Karin Laserow, Britt Berg, and Niklas Lundstrom addresses an issue many of my clients tackle: How to blend fine antiques into their contemporary or modern decor. Released earlier this year, this book provides “a comprehensive guide to blending beautiful antiques into a modern home.” While the book focuses on Swedish antique furniture, the principles used by the designers here will work with any type of antiques you’d like to incorporate into your modern home. Beyond antique furniture, the book helpfully talks about how to display antique decorative objects, such as candlesticks and chandeliers, in your decor as well. Blending all these elements seamlessly can give you the contemporary look you like with the fine antiques you love. Many of our clients tell us they’d love to do what we do. If they knew the truth about our buying trips — the long plane flights, sleepless nights, and exhaustion — they might not be so eager! But if you’re planning a trip to England this year anyway, why not indulge your passion for collecting at the same time? The Vintage & Antiques Fairs of England by Sandy Price, forthcoming in June, 2013, offers you a comprehensive guide to 41 specific English antiques fairs and flea markets. You definitely can plan an entire vacation around shopping for antiques. Written like a travel guide, this book includes lists of things to see and do near each of the markets profiled. Not a collectors’ guide, The Art of the Muscle Car: Collector’s Edition by David Newhardt, Peter Harholdt, and Brock Yates celebrates the American muscle cars serious collectors crave. Forthcoming in May, 2013, this edition updates the original with stunning cover art and superb photographs on the pages between. This book will look fantastic sitting on the coffee table in the man cave. Even if you aren’t among the elite who can afford to collect cars, you’ll take a fun trip down memory lane with this book that pictures all the cars you lusted after in your youth, from the Super Bee to the Cobra Jet to the 442. You know what I’m talking about. Do you have any favorite books about antiques or collecting? Drop a note in the comments to let us know which books you can’t live without! This entry was posted in Bookshelf and tagged American muscle cars, antique decorative objects, antique fairs of England, antiques books, Art of the Muscle Car, books on collecting antiques, car collecting, car collectors, English antiques fairs, English flea markets, guide, how to blend antiques into decor, Swedish antiques on February 14, 2013 by admin. Russell says he’s had a love of antique clocks since he was a small boy. While visiting his aunt in Pennsylvania each year, he’d stop by the neighbors’ home. The elderly German couple there would patiently show off their collection of cuckoo clocks, and Russell was bitten by the collecting bug. In fact, he has his own sizable collection of antique cuckoo clocks. However, Russell says Art Deco is his favorite era. He has purchased six Art Deco clocks and one Art Nouveau clock from us so far. “I just really have a love for art and design from this period,” he said, going on to add, “I will definitely continue to frequent your shop because you really have an eye for beautiful high quality antique clocks.” We really appreciate hearing that from an expert in the field of antique clocks! Here are a couple of the Art Deco clocks Russell has purchased from us. In case you’re wondering, Russell spends about 20 minutes winding his clocks every Sunday morning. He runs them in cycles of about a dozen at a time, he says. “Once in a while I run them all at once for kicks, but it gets too loud on the hour when they all chime, and I get annoyed because I like to hear each clock chime,” he laughs. We’re delighted Russell offered to share his story with us, and equally delighted to have helped him with his antique clock collection! If you love to collect a particular type of antique and would like us to feature it on the blog, just drop me a line. I’d love to hear from you. Thanks again to Russell for sharing his wonderful story and fabulous photos! This entry was posted in Antique Clocks, Client Spotlight and tagged Antique Clocks, antique cuckoo clocks, Antique Regulator Clocks, Art Deco Clocks, Art Deco Wall Clocks, Art Nouveau clocks, Black Forest clocks, Dutchmasters Joinery, Enfield, Mauthe, Regulator clocks, Tick Tocks Antique Clocks, Westminster on February 12, 2013 by admin. Antique Furniture Care – What Should I Do? Here at EuroLux Antiques, we are often asked how to best care for antique furniture. Just remember these five key tips for antique furniture care, and your antiques will look great for many years to come. My best piece of advice when it comes to caring for antique furniture is to avoid air blowing directly on your piece of furniture. Don’t place antique furniture over or next to a heat register in the floor or under a vent in the ceiling. Wood separation, splitting, and cracking are exacerbated by fluctuations in temperature and humidity. Find out more about wood separation here. Direct sunlight falling on a piece of antique furniture will cause the finish to deteriorate at an accelerated rate. Eventually the finish will look very faded and washed out. Of course, you don’t need to keep your home in the dark in order to care for your antique furniture. Just be sure to have some sort of sheer curtains, or blinds, so that you can diffuse harsh sunlight. If you live in a geographic area where there are significant swings in humidity throughout the year, you may want to place a humidifier in your home in order to help care for your antique furniture. The moisture content in the wood of your antique furniture will adjust to the ambient humidity in your home. These fluctuations throughout the year, from the humid days of summer to the dryness caused by heating your home in the winter, will cause an increase in wood separation, and may result in splits and cracks in your wood. Don’t use cleaning products that you spray on your antique furniture. These products actually create a waxy buildup over time that will make your antique furniture look hazy and dull. They actually attract dust, which means you have to buy another bottle of the product, making the manufacturer happy. Just use a soft rag, very slightly dampened, or a duster, to lift the dust on a regular biweekly or monthly basis. The best way to care for your antique furniture, on an on-going basis, is to use a good paste wax once per year. There are quite a few brands of paste wax available on the market, but we prefer TLC wax. We find it gives a beautiful glow and is easier to work with than other brands. Apply a thin layer of paste wax with 0000 (4x) steel wool and then buff off with a microfiber towel or use a brush attachment with a drill. Remember these 5 tips for antique furniture care and your antiques will look beautiful for many years to come! Aimee owns EuroLuxAntiques.com with her hubby and best friend, Greg. Aimee sources amazing antique furniture, vintage lighting, & high-quality reproduction furniture to help her customers decorate their homes in a unique way. She loves her 8 (you read that right) fuzzy children and is renovating a 1920s bungalow in South Carolina. Connect with Aimee on Google+ or sign up to receive this blog in your inbox! This entry was posted in Antique Furniture, Restoration Tips & Tricks and tagged Antique Furniture, antique furniture care, how to care for antiques on February 11, 2013 by admin.